Last month, we participated in a tasting sponsored by Le Cercle Rive Droite grand Vins de Bordeaux (The Right Bank Circle of Great Bordeaux Wines) featuring appellations east of the Gironde River such as Pomeral, Saint Emillion, Fronsac, and Castillion. Founded in 2002 to further assure quality and market new vintages, the organization represents 139 chateaux, 31 of which were present at the tasting held at Camponile Restaurant near La Brea and Wilshire Blvd. Arguably the world’s most famous wines come from Brodeaux in western France, along the Gironde River as it navigates toward the Bay of Biscay. The river plays an important role in defining Bordeaux wines. The French were leaders in establishing strict standards to their wine regions, regulating varietals, farming techniques and appellation identification. All Bordeaux wines are blends of, primarily, dominant Cabernet Sauvignon or Merlot with support from Cabernet Franc, Petite Verdot and Malbec. This is where the Gironde River plays an important role in defining the “leader of the pack” on the regional wines. Wines produced in vineyards west (Left Bank) of the river use Cabernet Sauvignon as the dominant grape and those on the eastside (Right Bank), merlot. A typical blend from the Right Bank might include 45% merlot, 25% cabernet sauvignon, 15% cabernet franc, 10% petite verdot and 5% malbec. Reverse the merlot and cabernet sauvignon and you have a Left Bank Brodeaux wine. The Le Cercle Rive Droite Grand Vins de Bordeaux event introduced us to vintages 2008 through 2010 of those Right Bank, merlot-based blends. Comparisons can be fun but it soon became apparent that vintages 2008 and 2009 were set up to showcase their prized vintage 2010. Many of those pouring wine recommended that we start with the newest vintage. 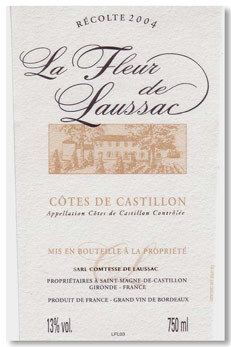 My tasting began with the Chateau de Laussac Castillon/Cotes de Bordeaux, Vintages 2008-2010, produced from very old vines and traditional vinification methods. The 75% merlot-25% cabernet blend goes through the malolactic fermentation process in thirsty new oak barrels, a method that helps insure a more accessible flavor and balance to the wine. Although vintage 2010 had minimal bouquets related to the others, the flavors were very forward and concentrated with hints of vanilla and well-balanced acidity presenting the option of drinking now or later. I am beginning to understand why Bordeaux is quite anxious to showcase the vintage 2010, a source of pride to the region. It will be interesting to discover if this trend persists in other wines. From the Fronsac appellation, the 16th Century Chateau de la Dauphine now produce merlot and cabernet franc on the same vines in heavy limestone soil. One would expect an 80% merlot blend to be soft and accessible, but the Chateau de la Dauphine Fronsac Vintages 2008, 2010 delivered more concentrated fruit than anticipated with vintage 2010 bringing a soft minerality throughout a very long finish. 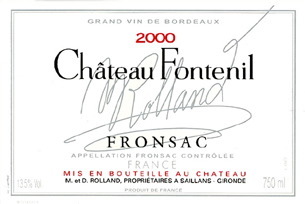 Another local estate, Chateau Fontenil Fronsac ($40-55) creates a heavily merlot-dominant blend amid the limestone that, in past years, has received consistent ratings in the low 90 pt. range. Vintage 2008 had very expressive fruit on the nose and soft tannins. Resolved that it needs more time on the bottle, vintage 2010 still conveyed nice spicy herb bouquet and highly concentrated fruit. If you can find a bottle, decant it. Some research revealed that K&L Wines (www.klwines.com) is selling futures for vintage 2009, with delivery anticipated in late 2012. The malolactic fermentation process, through the introduction of lactic acid eating bacteria to the barrel, is designed to balance the acid in the wine, exposing more concentrated fruit flavors. One result of the process, the Chateau le Bon Pasteur 2010, from the Pomerol appellation, was, without question, the most balanced and flavorful wine at the event. One should expect a burst of fruit and spice on the nose followed nice earthy mushroom flavors. 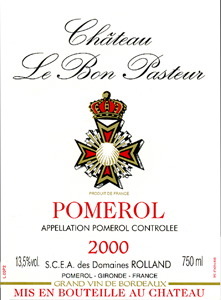 Also from Pomerol, the dark, inky colored Merlot-blend, the Clos L’ Eglise Pomerol 2010 offers very accessible, well-balanced flavors at a moderate price. We next tasted a flight of three vintages, 2008-2010, of the Chateau Fayat Pomerol, each with strong berry flavors and a long finish. The vintage 2009 stood out with a nice rose petal nose. 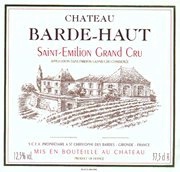 My favorite wine of the entire tasting was a wonderful Merlot-dominant Chateau Barde-Haut Saint-Emilion Grand Cru 2008 which had everything one could expect from a Bordeaux blend, very dark color, hints of lavender aromas, mild tannins, and abundant berry flavors that linger well after spitting. The representative explained that it was occasionally available at K&L Wines in Hollywood, something to watch for. French winemakers in all the regions hold the utmost respect for the soil. Whether it consists of river rock, limestone, red sandstone or clay, recognizable impacts from the soil are evident in all flavor profiles. With only 10% Cabernet Franc, the Chateau Rol Valentin Saint-Emilion Grand Cru 2008 combines grapes grown in both sandy and clay soils. The result is a very fruit-forward wine that maintains complex flavors through the finish. 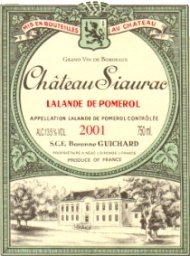 The vintage 2010 Chateau Siaurac Lalande de Pomerol, a medium-bodied blend, was very smooth and accessible with dominant black cherry flavors in comparison to the very earthy vintage 2008, my choice, with flavors of fresh herbs and mushrooms. Our afternoon concluded by sampling vintage 2008 and 2010 of the Chateau Vray Croix de Gay ($60), a red blend that is consistently rated in the low to mid-nineties. Both wines produced very concentrated fruit and were well-balanced. The vintage 2010 emerged for me as a very masculine wine, preceded by nice perfumed aromas. A momentous ending to a very informative event. Purchasing Bordeaux wines can be a bit tricky. Since demand often results in investment by U.S. consumers in “futures” to ensure access to the wines. A recent story in Wine Spectator magazines chronicled the quality of vintages 2008 and 2009 as both rich, powerful, yet with very accessible flavors. Reviews of twenty-three top 2008 red Bordeaux illustrated ratings ranging from 92-94 pts with costs from $45 to $3,000 per bottle. Another article entitled “Values Across Bordeaux,” is a good starting point in researching Bordeaux wines. Bottles of interest can be cross-referenced with lists and inventories in wholesale outlets throughout southern California. Ironically, before this article goes to print, I will have had an opportunity to visit wineries in the Cotes de Rhone, the other great French wine region with appellations from Chateaunef-du-Pape, Girondas, and Vaqueyvas. These blends consist of Grenache, Syrah and Mourvedre, among the 13 grapes, licensed by the AOC seal of quality assurance and permitted to be grown in the region. My experience is another future story, but I was able to purchase a bottle for under 20 euros. The moderate prices of local Rhone-blends are indicative of how much it costs to get it to U.S. shelves. This was a nice change; given one Euro is valued at nearly one and one half times our dollar. As a friend said, “Remember, that 10 euro salad is really $14”. So, the secret of French wines is to taste, purchase and consume them in France, preferably in a beautiful place like Provence, with salami, numerous cheeses, fresh radishes, local olives and bread. This entry was posted on Saturday, June 25th, 2011 at 3:24 pm	and posted in Wine. You can follow any responses to this entry through the RSS 2.0 feed.